barter their birthright in a mighty nation. I have always loved that quote by Du Bois and I am obviously not alone. The late Ossie Davis must have liked the quote so much that part of it was chosen as the title for the posthumously released book of his selected speeches and writings. Along with so many other blessings in my life, I count meeting him and his lovely wife, Ruby Dee, an honor; not because they are entertainers and I was starstruck but because of my appreciation for their unwavering sacrifices during the civil rights movement; for their unquenchable thirst for freedom and equality the world over. Ossie Davis who emceed the March on Washnigton, eulogized Malcolm X and spoke at one of the first gatherings of the Congressional Black Caucus in the early 1970s was not afraid to take a stand. Where social activism and acts of consciousness in the world of celebrity were concerned, Dee and Davis took their cue from Paul Robeson. 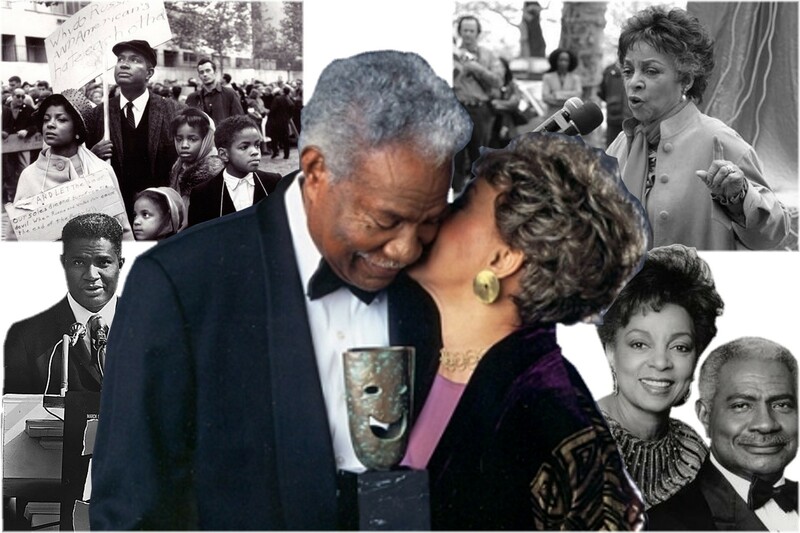 Ossie Davis and Ruby Dee shared a willingness to fight for what was right even if it meant there would be roles for which they would never be considered let alone cast. I reserve an unconditional love and respect for those who use their gifts for something more meaningful than self-sustenance. Some twenty or twenty-five years ago I got to introduce the pair as emcees for an event for some organization; I believe it was a TransAfrica event when Randall Robinson was still at the helm but my memory is sketchy around that fact. However, it is clear the person who was supposed to handle the introduction could not be found … and there I was … able to speak clearly and distinctly … at the intersection of Opportunity and Preparation streets. There is something to be said for just being “there” at the “right time”. Just before I was to go deliver my line I spied Ossie Davis and moved in his direction. I, a relatively shy, twenty-something thrust myself in the path of this acting icon and stuck out my hand. “Mr. Davis”, I said interrupting his leisurely stroll to the other side of the room to meet his wife, “it is a pleasure and an honor to meet you”. I continued, “Thanks so much for all you have done for us”. “Young man, the honor is all mine” he replied, as his hand met mine firmly and with great purpose. Somehow that was all I needed that day. I immediately reported backstage to deliver my line with no time to rehearse. “Good evening ladies and gentleman. Please welcome your hosts for the evening, Mr. Ossie Davis and Ms. Ruby Dee”. That was it. That was my line; delivered in my best radio disc jockey voice, a voice that I had practiced no less than a million times in the comfort of my bedroom and, at times, in the shower. God afforded me an opportunity that and I made the best of it. I had acted on what felt right in my spirit without knowing how those few moments would linger for years in my mind that I may share them with you … at this moment. I learned how to discern when it was my spirit or God speaking at a relatively young age. My father used to tell me whenever you find yourself saying, “I knew I should of …” that was God’s way of letting you know that you had just ignored His option. It makes itself known to us with “that feeling in our gut … and it’s not gas”. Dad would often punctuate his comments on heavier subjects with humor thereby making them easier to digest and impossible to forget. God always gives us the right answer but most of us seldom listen. Many of us are either too weak or self-absorbed to follow God’s directives at the first request. And it wasn’t just Dad but the majority of those with whom he encircled himself reinforced the same sentiment; living proof that iron does indeed sharpen iron. God has a way of taking the ordinary and ordaining it thus making it extraordinary. Throughout all scripture God used ordinary folk to affect His kingdom in extraordinary ways. And as disparate as these folk may have been they had two things in common … a willing ear to hear God’s voice and a responsive heart ready to respond to God’s call. That day, with Ossie Davis and Ruby Dee, started out as an ordinary day for an ordinary young man yet something quietly extraordinary happened. Though unbeknownst to anyone in the room, a spark had ignited a flame that still burns today. We have all met men and women who have heard and responded to that voice in their gut; that voice that lets them know when something isn’t quite right; that voice that whispers charity and justice are not synonymic; that voice that recognizes even though we may be “preachin’ to the choir” the choir must not be singing… or at least not loud enough. ← Election’s Over; All Hands on Deck!